So I started the morning with a very curt and polite email to Varen. As I said before, we haven't been talking or mailing since Tuesday because he decided he needed some space. And, since I'm a respectful sort of person (sort of), I respected that and have not attempted any contact since then. Until this morning. I needed to say Goodbye. It is his last day at our mutual company and it seemed the right thing to do. Also I needed to tell him that I wouldn't be attending his farewell drinks later today due to his same request for space. I also mentioned that this would be the last email I sent him ... and if he did ever want to get back in touch with me, it was up to him. A little while later he mailed me, "hi". And so it began. Innocently at first, until I asked exactly what he was doing after having asked for his space, since he hadn't made a single mention of reading my initial email (I'd sent it to his gmail address, not his work one so I wasn't sure whether he'd read it or not). After some far too deep and meaningful emails about the wrong perceptions we both had of how the other was coping post break-up, I called him to ask him why he was doing this? We chatted and he said he really wanted to see me so, either I should go to his farewell or he was coming to see me for lunch or I needed to tell him that I didn't want to see him and he'd leave it at that. I couldn't do any of them. I wanted to see him too, obviously ... we have that chemistry I was talking about ;) But I knew it would be a bad idea ... so before I could figure things out in my head, he said he was coming over (to our other offices) now. And he came over and we went for a very nice lunch, good old Mochacho's, just like before :) And now what? Exactly how much had we screwed with our mental and emotional well-being? Obviously not enough because somehow we ended up at my house after lunch, luckily (?) I live quite close to our Second Offices. Crazy stuff. So, I'm confused. We can't date again, we can't go back to the casual "seeing each other" that we tried after the last time we broke-up. I don't really know what happens now, does anything? I guess we'll play it by ear. As I said, we've tried breaking-up loads of times. So for now, for safety's sake (emotionally and mentally), I'm still single ... but I wouldn't rule out seeing Varen again ;) See, I must be stupid. Oh, and the Life we might've saved ... as we were leaving my place and heading back to work, we noticed Honey in stalker mode. And then we saw a cute colourful little bird hiding against the glass sliding doors. 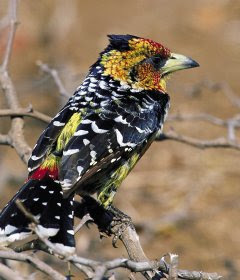 Dad says it's a Crested Barbet (and it must be since I found that picture >). Clearly this bird was not flying away and after chasing the cat away, we noticed there seemed to be something wrong with it's wing. I couldn't just leave it to die by cat. Have a fabulous Easter Long Weekend, everyone. The bird is fine as you will see in my next post.